Thami Mhlambiso, Representative of the African National Congress of South Africa (ANC) to the United Nations, addressing the Security Council in New York, June 18, 1976. In response to the killings of student demonstrators by police on June 16, the Africa States asked the Security Council to consider the "killings and violence by the apartheid regime in South Africa" during the proceeding days. 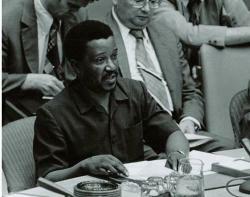 The following day the Security Council adopted Resolution 392 (1976) strongly condemning "the South African Government for its resort to massive violence against and killings of the African people including schoolchildren and students and other opposing racial discrimination" and calling on the South African government to end the violence and eliminate apartheid. PAC Representative David Sibeko also testified.